Kasia Kines2018-07-30T13:04:54+00:00July 30th, 2018|SIBO|Comments Off on If you have EBV and Digestive Issues, Could You Have SIBO too? If you’re suffering from bloating, painful gas, diarrhea, constipation, mixed digestive patterns and/or poor nutrient absorption — which impact OVER 400 million people worldwide — you’re not alone and there ARE solutions! If you already know you have EBV, you are lucky to know THAT. Many people don’t. But if you are doing everything right, and you still have all these gut symptoms and you cannot get better, you may also have developed SIBO. While there is NOT A SINGLE study on the connection between EBV and SIBO to date, I have noticed a pattern as quite a few of my EBV clients have SIBO and vice versa. A coincidence? I was honored to be invited by Shivan Sarna, a health advocate who herself suffers from SIBO and IBS, in her outstanding IBS and SIBO SOS Summit, which will air free Sept 3-10. We jumped right into the issues related to EBV as well as SIBO and some connections I have been seeing!!!! The speaker line up (more than 40!!) are some of the best in the field, so you definitely do not want to miss it. The IBS & SIBO SOS Summit is hosted by health advocate and popular TV personality Shivan Sarna. Shivan asks the questions YOU would ask if you were in the room with these experts. 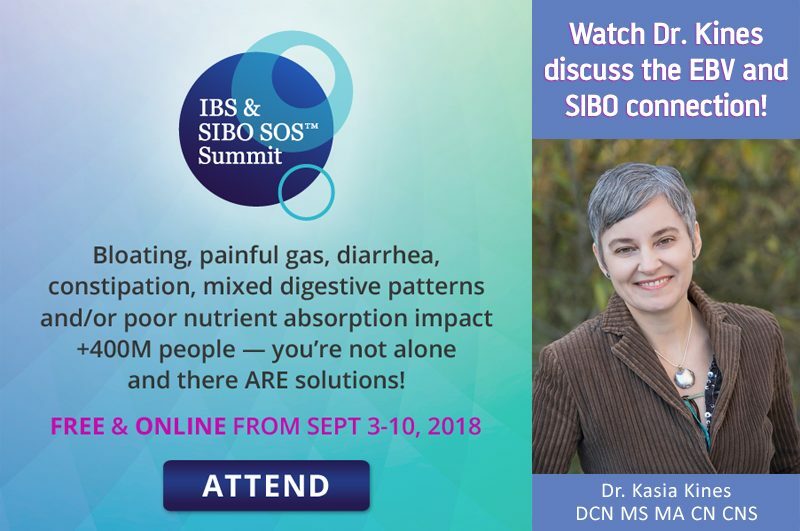 The IBS & SIBO SOS Summit is online and free from September 3-10, 2018!